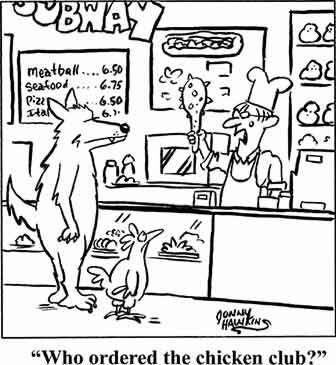 Mr. Fox has to be every poultry keeper’s number one enemy. Sadly, many people have lost their chickens or other poultry to a fox. When it happens, it can be devastating. When I was 7 years old, I went down to the chicken house to open the outer run door to let our small flock of hens out for their usual free range of the garden. On opening the door, I saw all of our hens killed inside the house with their heads removed. Only one hen had survived and was petrified, hiding in a tree where she had escaped the attack. Crafty Mr. Fox. Usually a poultry keeper’s number one problem? Whilst I love nature and have a live and let live attitude towards most things, this experience has given me a vivid memory of a fox attack and that makes me pretty vigilant when it comes to keeping my chickens and ducks safe. I appreciate that not all of the protection methods here will suit everyone, but I will give you as many ideas as possible to help you keep your chickens safe. 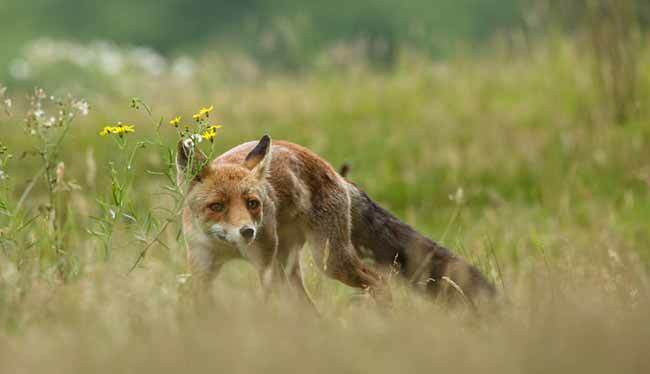 Which method(s) you choose is up to you but I do appreciate many people like to see foxes around, yet others don’t and would rather kill them…This article aims to give you some practical advice on how to alleviate or eliminate fox problems. You can decide which methods are best suited to your views on foxes and how much time and energy you need to invest relative to the scale of the problem. Whatever your view of Mr. Fox I hope you manage to keep him and your poultry apart! Was it a fox that killed my chickens? Foxes are careful, fastidious hunters and there isn’t normally much evidence of a visit. If birds are out in a large run or field during the day, a small patch of feathers is normally all you will find. They do of course need an entry and exit point and if the area is fenced, this is normally a small hole under a gate or fence. There will usually be no signs of entry if they have managed to get over the top of a fence. 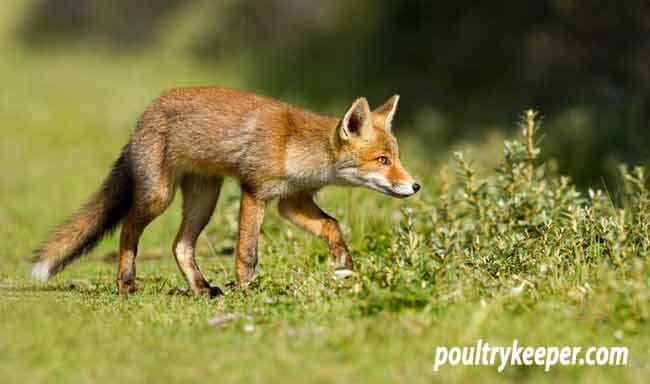 If a fox gets into a small run or chicken house and there are a number of birds in there, they can get into a killing ‘frenzy’ and will kill 30 or more birds, usually taking only one bird with them. Typically, they will bite the heads off the birds. Sometimes, they will bury the bodies if there is enough loose soil. The photo to the right shows a duck that was killed and part buried. There were scrape marks on the ground where the soil had been gathered. How many foxes killed my chickens? Foxes are normally lone hunters, except when they first leave their mother when they will often hunt as a pair or a trio. They are pack animals and will keep in touch with the other members of their family by barking. You can sometimes hear this at night. So it is normally only one fox. When are my birds most at risk? The times your birds are most at risk is when foxes are feeding their cubs in the spring. Another time to be careful is around August time when the mother leaves the cubs to go and find their own food. You are more likely to have a visit from a fox during the daytime when the cubs are learning to hunt and aren’t so wary of people. I have had young foxes sitting at the end of my garden watching me release my ducks out into their run at this time of year. Are urban and country foxes different? There is no difference between an urban and a country fox – they are both the same species, however, the fox has adapted to many different environments around the world. The urban or country fox is one and the same species. Both urban and country foxes do not know how to hunt in the different environment they are presented with. Problems can occur when somebody has caught a fox in a trap and released it into the countryside as this fox is in unfamiliar territory and does not know where to get its food from and is often in another foxes’ territory and will be attacked. There are two options here which are THE most effective means of protection if done properly: poultry fencing or an electric fence. A good fence should be at least 6 feet high if it’s not electrified and ideally have an outward sloping top to prevent the fox from climbing over into your chicken run. Electric fences are becoming more popular and are really quite good at keeping foxes out if they are working correctly. If the battery is flat, or the fence is shorted to ground via some overgrown vegetation touching the wires then it is a pretty pointless exercise. Electric fences come in two varieties – electric poultry netting that has electric strands running through it and the electrified ‘wire’ that is placed in front of the existing fence to stop a fox digging under or climbing over the fence, often called a tri-wire. To be effective, there needs to be electrified strands at sniffing height. A fox will always use its nose to investigate first and after receiving a shock from the fence, it will act as a psychological barrier. In studies (by Wildlife Online) foxes have normally received a shock from an electric fence once, occasionally twice before learning to stay away. Once they have received a shock, they will not dig under or jump over a fence, even if they can easily clear the top of the fence (such as with electric poultry netting at only one metre high) so these are an effective barrier to protect poultry. This seems to be obvious – and of course it won’t stop visits during the late afternoon or early morning but you are more likely to have a fox visit during the night. So lock up those birds EVERY night without fail! I use this automatic pop hole opener made by AXT Electronic in Germany for my chickens. These cost you a few bob but work very well indeed. They close your pop hole when it gets dark and reopen it when it gets light. I also use the additional time clock module though which keeps the door closed until a preset time in the mornings – this stops the chickens from going out at 4am during the summer months when they could be at risk from a fox and also keeps my noisy cockerel inside until a sensible hour in the morning! Some manufacturers include the timer in their design. You can see a range of different models for sale on this page here. Another fairly obvious one but imagine a dog with a tugger-toy, a fox is no different in terms of strength and if he can get hold of a panel or door he can tug quite hard to open or break it. Flimsy door catches on a hen-house in an unfenced area present no great challenge to a determined fox. Humane fox traps can be bought from various country stores and online suppliers. These are large cages that are baited. When the fox enters, it triggers the trap, closing the door behind him. Traps are placed on a run known to be frequented by the fox. They need to be camouflaged since foxes are very intelligent creatures. Traps must be inspected frequently and of course the big question is what to do with it if you succeed in capturing it. 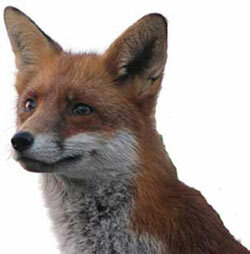 A trapped fox must not be released elsewhere (see below) they must be humanely dispatched. A suitable shotgun or firearm is the usual method although the person (in the UK) must hold a valid shotgun certificate. I personally do not believe in ‘re-homing’ a fox by trapping it, then driving out-of-town to the countryside before releasing it. Firstly, foxes are territorial animals and other foxes in the area will attack it, secondly, it will need to eat before too long and doesn’t know where to find food in its new environment. The fox may find somebody else’s chickens but will probably starve to death. Finally, the local farmer will probably have to go out and shoot it. Foxes, like dogs learn from their environment as cubs. An urban fox has learnt different methods of scavenging and hunting to foxes in the countryside so it will be a very unpleasant or slow death for the animal. A flashing light can work as a deterrent as long as you move it around regularly. Once the fox gets used to it, it will no longer be scared but can be a useful deterrent in the shorter term. This fear of new or unusual items in their territory is called neophobia. There are several units available that flash lights and are designed to mimic the reflection of eyes watching the predator. You can see a selection here. 6. Can our dog keep foxes away? A family dog may keep a fox away. The fox can smell the presence of the dog which can put the fox off but if it’s hungry, it will probably just avoid the times that the dog is around and since dogs are social animals, it would be cruel to leave a dog on guard on his own for long periods of time. Providing that the area is suitable for shooting, with the correct Shotgun certificate or Firearms Licence and the right sort of gun, foxes can be shot to keep their numbers down. When fox numbers have reached a certain level, they will regulate their own numbers so shooting a number of foxes will cause a greater number of vixens in the area to have cubs the next spring. An experienced waterfowl keeper whose husband was a keen shooter said they do not shoot foxes in their area because they have learnt they can’t get in to their field after touching the electric fence where they keep their birds so will not keep trying. If you shoot these foxes, more foxes will move into the area! 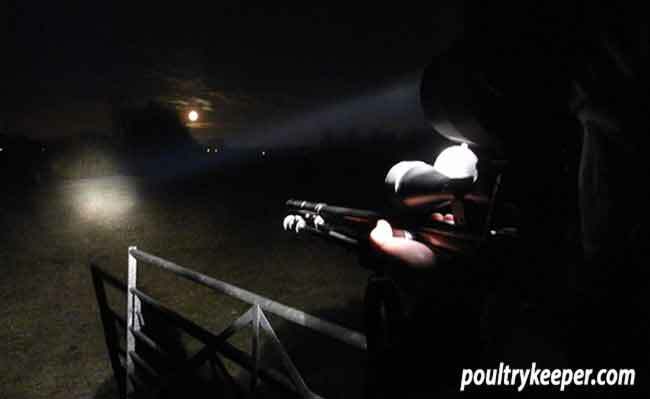 A separate article “Shooting Foxes” gives more information about the licence requirements in the UK and methods of luring the fox to within range of a gun if you would like to learn more about this method of control. 1. Foxes only come out at night. 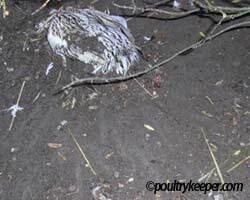 Whilst they prefer the cover of darkness and your chickens are mainly at risk at night, some attacks actually occur during the daytime: the chickens are out in the garden or field, there’s a quick dash from the hedge and all you find is a heap of feathers. Young foxes that are learning to hunt for themselves will often be out during the daytime and will be brave enough to approach areas that older foxes would avoid. 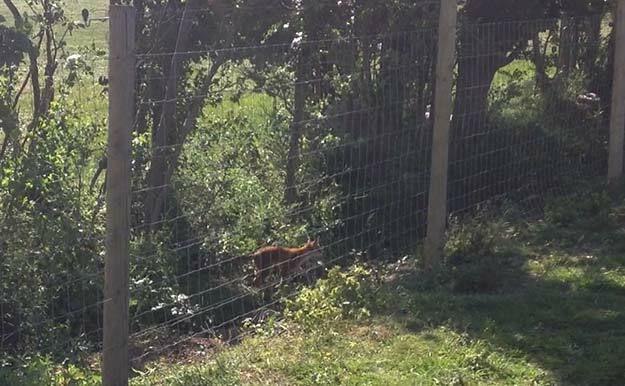 A young fox taking a stroll along my fence during the day. 2. A fox cannot get through chicken wire. Large foxes can ‘tear’ 1 inch chicken wire open with his teeth to gain entrance to a chicken run. This is normally only if the wire is weak, loose or damaged in some way. The rectangular wire seems more successful but a hungry determined fox can get his teeth into 1 inch round chicken wire (sometimes called rabbit wire) and pull, stretching the wire until it breaks. Try to get the strongest wire you can for your chicken run or double up the wire on the lower sections that are most at risk. Not all chicken wire is equal! Look for heavier gauge, galvanised wire and buy from a reputable supplier. There is more guidance on how to build a chicken run / poultry fence that is secure from foxes here. 3. Foxes can’t jump over a 5 foot fence. Oh yes they can! I’ve heard of people losing chickens after a fox scaled their 5ft high fence and I have lost birds too. Generally, you should provide at least a 6 foot high fence to keep foxes out. Ideally provide a mesh roof or an outward facing slope like you see on security fences. You also need to bury the wire a foot under the ground, or lay a foot flat on the ground and peg it down. The grass will grow through it and it will disappear after several months. It’s a lot of work but if you do the job properly, it will save you so much heart ache and cost.